Watch reporter Clifton Adcock take the handgun license quiz offered by Virginia. A loophole in Oklahoma law allows individuals to obtain a valid handgun license without ever firing a practice shot or picking up a gun. Scores of Oklahomans have avoided the state’s requirement to take live firearm training with a licensed instructor in order to obtain a license to carry a concealed or visible handgun. The applicants instead apply for a license in a state such as Virginia that requires the applicant only to take an online quiz and pass a background check, which Oklahoma also requires. Oklahoma recognizes licenses granted in other states. The loophole has sparked online coupons advertising for obtaining a “non-resident handgun license.” The applicant for a Virginia license watches a short video, takes a 20-question, true-false and multiple choice quiz, and turns in background check information. Virginia officials say more than 150 Oklahomans have obtained a nonresident license from the state. According to one site that offers the class, carryacademy.com, 99 percent of those who take the quiz pass it the first time. 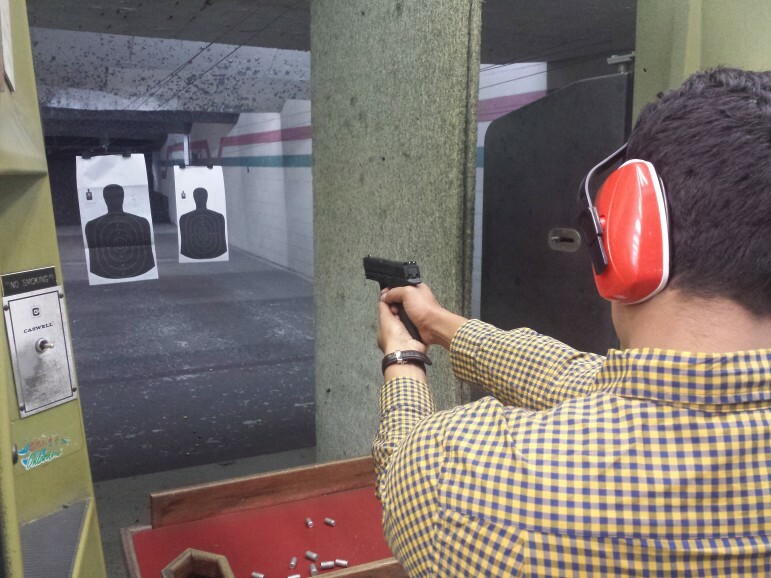 A patron at H&H Shooting Sports in Oklahoma City practices at the complex’s gun range. The business also teaches handgun training classes for Oklahoma’s Self-Defense Act license, but a loophole in state law allows some to circumvent the state’s in-person firearms training requirements. An Oklahoma legislator has introduced a bill that would close the loophole. House Bill 1391 by Rep. Casey Murdock, R-Felt, would require Oklahoma residents to have Oklahoma-issued handgun licenses and keeps the requirement that applicants demonstrate proficiency with a handgun under the supervision of a licensed firearm instructor before receiving their license. However, the proposed law would allow the Council on Law Enforcement Education and Training to develop an online class for handgun license applicants. Murdock said he introduced the bill because in many rural areas it can be difficult to attend handgun license classes. Only two – one in spring and one in autumn – are offered in his area, said Murdock, who is a handgun license holder. Murdock said he is alarmed by the current law’s not requiring an applicant to fire a gun. Oklahoma’s firearm training requires that the applicant undergo about eight hours worth of instruction and show proficiency with their weapon. States as Virginia and Nevada are more lax, but Oklahoma accepts their licenses. Public officials have often cited Oklahoma’s required firearms training as a way to ensure the public’s safety and ensure the license holder is a responsible gun owner, while also expanding where and how people can carry their weapon. Several bills filed this legislative session would further expand where and how handguns can be carried: License holders could bypass security checkpoints and carry a gun into the State Capitol, carry a handgun at a public university or college or store a gun in vehicles in state prison parking lots. Several websites offer online training courses for nonresident licenses. Sites such as Groupon offer discounts for the online courses, making them as low as $25 per person. Will Andrews, a licensed firearm instructor who manages the concealed carry classes at H&H Shooting Sports in Oklahoma City, said going through in-person training is important, because students will be taught specifically what Oklahoma law says a gun owner can and cannot do with a firearm. “There are things in the law, what the law actually says, that surprises someone every time we do the class,” Andrews said. “Generally, people are shocked because the law is much more restrictive than they had originally envisioned,” Andrews said. And the state law requiring that a license applicant be proficient is important because of obvious safety reasons, Andrews said, though additional shooting practice is encouraged outside the class for students to hone their skills. Mike Boring, district attorney for Beaver, Cimarron, Harper, and Texas counties, brought the issue to Murdock’s attention. A handful of people claiming to be members of the shadowy activist group “Anonymous” showed up to counter-protest during Muslim Day at the State Capitol Friday.